• 5,500 sq. ft., 6 bath, 6 bdrm single story - MLS® $749,000 - Beach Front home!! 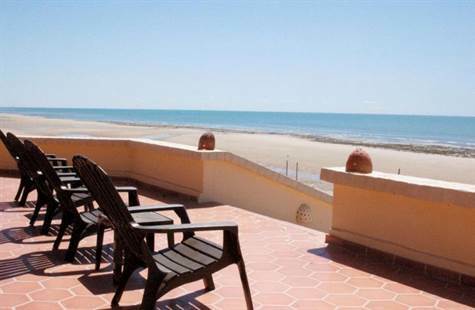 Las Conchas, Puerto Penasco/Rocky Point - Mexican charm defines this beautiful Las Conchas beachfront vacation home, designed for luxury family living. Situated high upon a dune that curves down to the warm waters of the Sea of Cortez, this home has panoramic ocean views & spacious accommodations for the most discerning buyers. Main house features three bedrooms with master suite & guest room opening upon beach side covered terrace. Master bedroom also has attached office with DSL/VOIP connections. Expansive great room with vaulted beamed ceilings, open to kitchen & dining areas is perfect for large families & entertaining. Separate casita w/1 bdrm, ba & mini kitchen & guest house w/2 bdrms & baths. 4 car garage, 3,400 sq ft interior, 2,100 sq ft patios. Fully furnished, turnkey, ready for move-in. Call agent for preview. Posted: Wednesday, May 02, 2012 5:19 PM by Grant MacKenzie Sr.